Dr. Chen has studied the application of Biosystems engineering to Bio-industry and medicine. He received his Bachelor’s and Master’s degree in Agricultural Engineering from National Taiwan University in 1978 and 1980. He studied the processing engineering of agricultural products at the Agricultural Engineering Department, the Institute of Engineering and Science in the University of Minnesota from 1985 to 1988. The minor was Chemical Engineering. He received his Ph.D. in 1988. 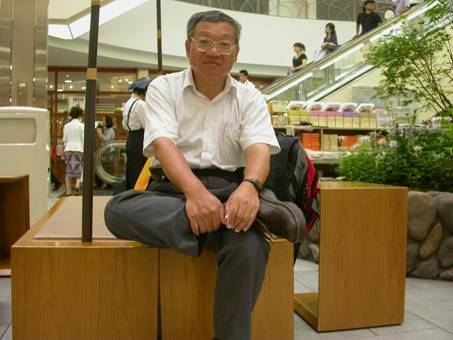 He served as an Associate Researcher in the Taiwan Agricultural Research Institute in Taichung, Taiwan in 1988. He was appointed as an Associate Professor of the Department of the Agricultural Machinery Engineering, National ChungHsing University in 1996, where he changed his research projects from agriculture to bio-industry. He was promoted as a Professor in 2000. His current research and scientific interest focus on Biomedical instrumentations, Sensing systems, Plant micropropagation, Modeling of orchids production and Protected culture in subtropical climate. Tsai Y. and C. Chen. Development and testing of a perspiration measuring system. Medical Engineering & Physics 2010, 32:356-362. Chung, W. and C. Chen. Huang CM, Chang HC, Li TC, Chen C, Liao YT, Kao ST.
Acupuncture Effects on the Pulse Spectrum of Radial Pressure Pulse in Dyspepsia.American Journal of Chinese Medicine. 2012, 40(3):443-454. Huang C. H. Chang, S. Kao, T. Li, Y. Liao, C. Weiz, and C. Chen. Application of sphygmography to detection of dyspepsia and the rhinitis. American Journal of Chinese Medicine 2011, 39(2):271-285. Huang C., H. Chang, S. Kao, T.Li, C. Wei, C. Chen, F. Chen and S. Tsou. Radial pressure pulse and heart rate variability in Normotensive and Hypertensive subjects. The Journal of Alternative and Complementary Medicine 2011, 17(10): 1-8. Huang C., H. Chang, S. Kao, T. Li, C. Wei, C. Chen, Y. Liao and F. Chen. Radial Pressure Pulse and Heart Rate Variability in Heat- and Cold-Stressed Humans. Evidence-Based Complementary and Alternative Medicine 2010, 75:1317, doi:10.1155/2011/751317. Improved calibration of frequency domain reflectometry probes for volumetric water content measurements of three media. Trans. of ASABE 2012, 55(1):1-10. Hsu, K. and C. Chen. The effect of calibration equations on the uncertainty of UV-Vis spectrophotometric measurement. Measurement 2010, 43:1525-1531. Chen C., Y. Weng and T. Shen. Evaluation of resistance-temperature calibration equations for NTC thermistors. Measurement 2009, 42(7):1103-1111. Uncertainty evaluation of conductance moisture meters for rough rice. Biosystems Engineering 2008, 99:508-514. Lin, Y. and C. Chen. Measurement of glucose and sucrose concentrations with time-domain reflectometers. Sensing and Instrumentation for Food Quality and Safety 2008, 2(1):1-8. Y. Shen and C. Chen. Preparation of reference materials for rice kernels. Biosystems Engineering 2007, 97(1):41-49. Lu, H. and C. Chen. Uncertainty evaluation of humidity sensors calibrated by saturated salt solutions. Measurement 2007, 40(6):591-599. Evaluation of measurement uncertainty for thermometers with calibration equations. Accreditation and Quality Assurance 2006, 11:75-82. Evaluation of air oven moisture content determination methods for rough rice. Biosystems Engineering 2003, 86(4):447-457. The growth model for tissue culture plantlets of Oncidium. Propagation of Ornamental Plants 2012, 12(4): 202-208. H. Hsu and C. Chen. The effect of light quality on the growth characteristics of in vitro cultures of Phalaenopsis. Propagation of Ornamental Plants 2010, 10(1):3-8. C. Chen and H. Hsu. Statistical technique for the evaluation of the effect of light quality on growing characteristics of in vitro cultures. Biosystems Engineering 2009, 103(3):257-264. In situ measurement of microclimate for the plantlets cultured in vitro. Biosystem Engineering 2007, 95(3):413-423. Huang, C and C. Chen. Physical properties of culture vessels for plant tissue culture. Biosystems Engineering 2005, 91(4):501-511. Lighting distribution models of fluorescent for plant micropropagation. Biosystems Engineering 2005, 90(3):295-306. Humidity property in the plant tissue culture vessels. Biosystems Engineering 2004, 88 (2): 231–241. Development of a heat transfer model for plant tissue culture vessels. Biosystems Engineering 2003, 85(1):67-77. Chen C. and R. Lin. CO2 Uptake Patterns in Phalaenopsis amabilis. African Journal of Agricultural Research 2012, 7(1):128-141. Chen, C. and M. Chien. The leaf growth model and influencing factors in Phalaenopsis orchid. African Journal of Agricultural Research 2012, 7(28):4045-4055. Chen, C. and R.S. Lin. Nondestructive estimation of dry-weight and leaf area of Phalaenopsis leaves. Applied Engineering in Agriculture 2004, 20(4): 467-472. Shen T. and C. Chen. Misting cooling technique for protected culture of Oncidium orchids in subtropical regions. African Journal of Biotechnology 2012, 11(80):14612-14620. Chen C., T. Shen., Y. Weng. Simple model to study the effects of shading nets on the greenhouse air temperature. African Journal of Biotechnology 2011, 10(25):5001-5014.